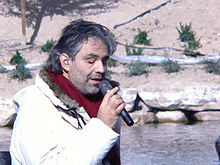 Andrea Bocelli (born 22 September 1958) is an Italian tenor and crossover artist. He was blinded by a Football accident at the age of 12, and later graduated from law school, before beginning a career as a singer. Since 1994, he has recorded both pop and Classical albums, and has sold over 85 million copies worldwide. He is generally considered as both the most popular Italian and Classical singer in the world, today. ↑ "SuBo duet with AnBo". The Sun. 2010-01-30. This page was last changed on 7 May 2016, at 09:21.